Hal Higdon has a wealth of running and editorial experience and he pulls together loads of research in this updated version of his book. It’s still a little out of date in that he celebrates being able to print off your running records from your computer, where everyone keeps them on Strava or some such now, don’t they? But the principles are still sound. So, the assumptions. As is often the case in running how-to books, and especially older ones when, to be fair, the field of running was less broad, running at 10-minute mile pace is seen as being the slowest thing in the world. Now I can run at 10-minute mile pace … for a mile. Just about. With a tail wind. It’s OK, because we all know there are a lot of fast people out there, but it feels like a bit of a kick in the teeth, even for someone who has run races at all distances up to marathons and has come to peace with her pace. There’s a kind of assumption that only beginners run that slowly and it’s something to progress away from. The standard, non-named runner is always a he, as far as I noticed, although to be fair women at both the sharp and beginner ends are mentioned and celebrated when individuals are being discussed. There are some slightly odd comments about how women are more intimidated by running on running tracks than men are (I’m personally seen equal numbers worrying about this!) and venturing into the gyms now, managing to cope with the testosterone-laden and muscly atmosphere (I’ve been happily gym-going from before this book’s publication in 2000 and haven’t found this) and apparently “the guys have become accustomed to having a gal pumping iron at the next bench”. Hm. And there’s one awful sentence explaining that women can benefit more from strength-training than men … “as long as the extra strength does not equal extra weight, or what some beauty-conscious women might consider ‘ugly muscle'” (p. 188). I’m sorry?? It’s such a shame, as he finishes that paragraph pointing out that strength training can help prevent osteoporosis, a good point undermined. But apart from that, this is a good, practical guide to building speedwork sessions into your running training. It goes through the different kinds and explains how to do the sessions and what they help with, all quoting research on the topic. Fartlek, surges, tempo runs, they’re all in here, explained and discussed, with plenty of examples from Higdon’s own running career. As well as the speed sessions, he covers good running form (hard without images, though) and some weight-training exercises (these are quite complicated and again, are not illustrated: I wouldn’t actually want to try the barbell lifts he describes without visual aids!). Very importantly, he stresses the importance of introducing all of these new things carefully and slowly, conservatively, even, which is very good news. So a good book in general, but a little outdated in a few aspects. Book Confession: how could I not order this lovely (direct from the publisher? 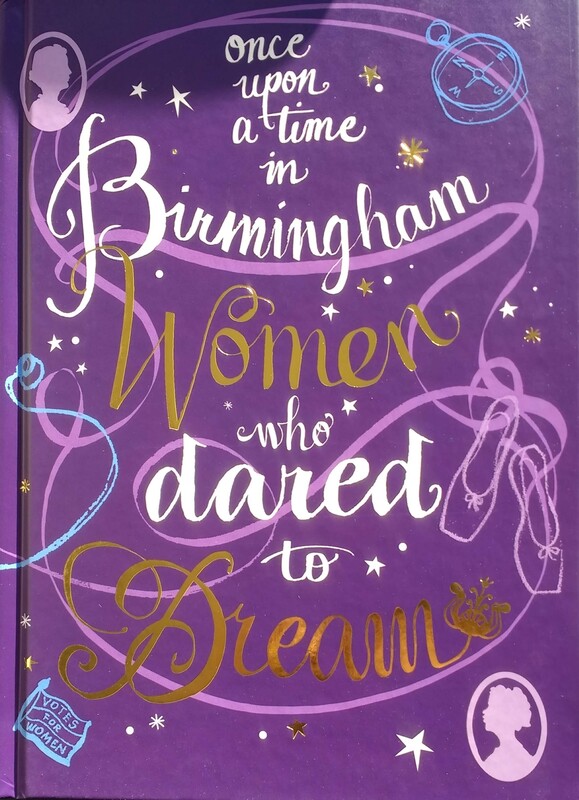 “Once Upon a Time in Birmingham: Women who Dared to Dream” is a collection describing a crowd-sourced selection of Birmingham women through the ages who have excelled, achieved and changed people’s lives. From Dame Elizabeth Cadbury to less-well-known names, it’s written by a friend of a friend, and features as one of the women, Imandeep Kaur, who I know through the running community. Published by local independent publisher Emma Press, you can find a direct link to the book here. Buy it for anyone from a young teen upwards, and especially to share our lovely city at home and further afield. Where is the running author from? Even today, it’s very common in American gyms for the weightlifting section to be away from all the cardio machines. Typically, you see women on cardio machines and men over in the weightlifting area, so I do agree with the author’s assessment that weightlifting can feel like a muscle-bound, masculine area of the gym. I’m glad to hear that it’s change in other places, though! He’s American and I’m in the UK, and yes, our weights area is away from the cardio but there are some superb strong and beginner and older women who use our weights areas and the great big blokes will usually move aside very politely when we take our turn, and vice versa. But then I’m immersed in sports and gyms and confident about that, so might be seeing it through different eyes. Gals, though??? Yes, the language is problematic, as are the authors ideas. Just pointing out that I noticed men on one side (with a random woman or two) and women bopping along on ellipticals on the other side. It’s interesting, it also might be the time of day one goes. There are some chaps who really go for it on the ellipticals in particular. Hal is kind of a running icon here in the US but I agree with you that some of his ideas are outdated. I used one of his running plans for my first marathon and it did not work well for me at all. His book on the Boston Marathon bombings was really good and I’d recommend that one. Oh that’s interesting – is it him who does the 10-day programmes, I can’t remember. What was odd about his that made it go wrong for you? Great review/thoughts Liz, though I’m not as into running as you are I always appreciate reading your enthusiasm and seeing how you merge your interests in running and books. Really liked your comment pointing out the potentially iffy issue on gender too, so glad we have people like you pointing out potentially harmful or false ideas. Thank you, Thomas, and yes, I always try to point that out (at least there weren’t illustrations with only Caucasian people or men or something!). I had another terribly sexist one a while back which was a real shame https://librofulltime.wordpress.com/2018/07/10/book-review-amby-burfoot-run-forever/ I particularly liked reading that women only run up to half marathons because they like to lead balanced lives. Hm. All that housework and hair styling does get in the way of running marathons … NOT! I second Wendy’s endorsement of his 4:09 book. Ah, OK, I will look out for that. And I have been putting his hill running techniques into practice to refine mine, so all good – and it will get shared on at club awards night, too! Interesting data point on your gym, as well. Ooh that Birmingham women book is one I might need. How have I never heard of it before? It’s been all over my Facebook feed but the woman who wrote it is a friend of a couple of friends who are outside our mutual friendship group in the main (I think she knows Katharine d’S though). The cover of the Birmingham book is gorgeous! As for running, what distance ultra are you planning to run? I think the idea that women don’t do anything with weights dates back to the ’80s when men were bodybuilding and women were all leggings and shiny leotards (or was that just me?). Looking back at photos of the owners of my gym, a married couple, they were both into bodybuilding and looked very peculiar! Nowadays it’s ‘in’ to do something with weights, whether that’s machines or free weights or body pump or total body workouts in a circuit class. I go to two different gyms, one targeted at a younger crowd, but actually used by all ages, and they do have a weights room tucked away that gets very limited use, but there are some pretty hefty weights being lifted all over the place by all sorts of people. Often the young and beautiful who never seem to raise a sweat, but not only them and most certainly not only men. The ultra we’re doing is 31 miles, so the least ultra distance you can do. I never had a shiny leotard and am hopeless at classes so have always gone for the weights! 31 miles sounds far enough! I follow a couple of blogs by ultra runners and it sounds like the sort of thing I might be better at than anything involving speed. Just plodding along, enjoying the scenery suits me fine. I haven’t really got the application to train for it, though. Classes at the gym are really far more my thing, but the days of shiny leotards are long behind me. Never say never though: with old age I may completely lose my inhibitions and go dazzle ’em! Some of them still have cut-offs (I’m quite a slow runner) but we’ve chosen one that has a walking option. Lots of info and advice out there if you do decide to try for one. I find long run training enjoyable, handily!